Has a pet raven in it. A classical Czech tale about seven naughty sons, whose mother turns into ravens. A young German man goes to buy a used wash-horse, but discovers the sellers are both dead. Fascinated by their pet raven, he forgets about the horse and takes the raven who turns out to be very special. A young girl's life is saved by a baby raven. 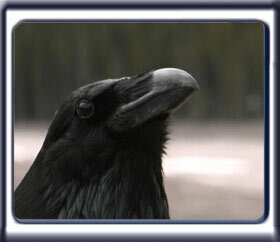 But after growing up, the raven's mischievous behaviors have neighbors demanding it be euthanized.